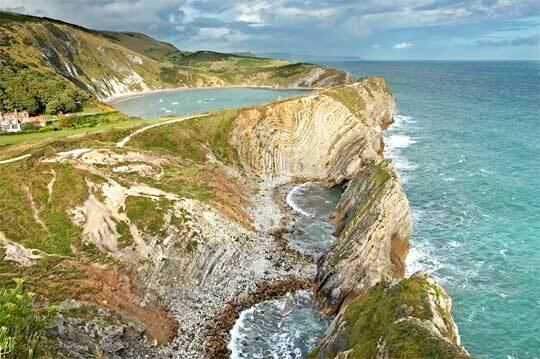 Discover and stay in the stunning World Heritage Jurassic Coast at Lulworth Cove, Dorset! Stay at Bishops Hotel, award winning boutique accommodation by the sea in the beautiful Lulworth Cove in Dorset! This Four Star Gold Award holiday accommodation with pool and dining facilities is an ideal escape for holidays and get-togethers. Bishops, which overlooks the World Heritage Jurassic Coast, was once the home of the Wordsworths (Bishops of Salisbury) and stands on the edge of Lulworth Cove, sheltered by Bindon Hill. Originally two cottages dating back to the 1650’s, the building is one of the oldest in the village and, the extensions and additions having been made with care, remains one of the finest architectural features of Lulworth. Accommodation a stone’s throw from Lulworth Cove and the gardens overlook the beautiful Lulworth Cove and there is a large swimming pool for our guests. We also have a running machine located by the pool for guests’ use. We accept small well behaved ‘handbag’ dogs in the Bar Room Suite only. We are delighted to have been awarded a 4 Star Gold Award rating by the AA. Alongside this, we have also gained an AA Dinner Award. There are 3 very large rooms/suites all over looking the courtyard and hills, 2 have seaviews. Room rates are from £50 per person per night including breakfast on a two sharing basis. The Restaurant is open for breakfast, lunch and evening meals and the bar is open all day and closes at 12:30am. email now to make a reservation! Lulworth House a few minutes walk to the Cove with light, airy creative and contemporary interiors offering en-suite accommodation in a family house from £80 per room per night including breakfast. It is an ideal situation to stay for exploring the coast, the Isle of Purbeck and surrounding areas of Dorset. www.lulworthhousebandb.co.uk Call 01929 406192 or email! Aquired by HF Holidays, the hotel formerly known as Lulworth Beach House, now back to its original name. Lulworth cove is set on the stunning South West Coastal Path which is probably one of the most beautiful parts of the 'Devon & Dorset World Heritage Jurassic Coastline' and areas of outstanding natural beauty. Lulworth Cove and the picturesque village of West Lulworth have pubs, restaurants, cafes and beaches all within EASY WALKING DISTANCE! Great walking country... This part of Dorset is an area of outstanding natural beauty with 30 miles of practically unspoiled coastline and countryside with unparalleled walks and beaches. This is partly due to the army taking over a large area during the Second World War to train for the D-day landings and in spite of promises that it would be returned to the residents at the time it is now still a tank training area. The walks across the ranges to the East of Lulworth Cove are open most weekends and during holiday times and are some of the finest in the Southern England. The Fossil Forest and the deserted village of Tyneham deep in the ranges above Warbarrow Bay is open most weekends and during the summer holiday period. There is a exhibition in the old school house depicting life in the village before the war and also the church is untouched and services are still held on occasions. To the West there are also great walks past Oswalds Bay, Man O' War Bay and Durdle Door towards Weymouth with convenient 'watering holes' at East Chalden and Osmington Mills depending on how far you want to go. The flora and fauna has flourishes in this area and offers wonderful opportunities to see many rare plants, birds, butterflies, reptiles and other animals. Purbeck is also famous for it's geology with 'The 'Fossil Forest' on the far side of the Cove and throughout the area there are many fossils to discover, from ammonites to Dinosaur footprints! Click here for a brief history of Lulworth..